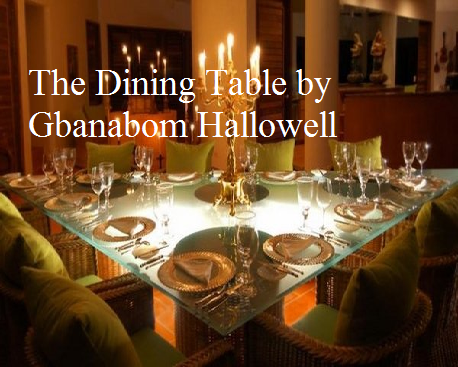 African Poetry: The Dining Table by Gbanabam Hallowell Summary, Setting, Author's Background, Themes, Language and Style for JAMB, WAEC and NECO Literature Students 2016 - 2020 Syllabus. The Dining Table is a poem written by Elvis Gbanabom Hallowell, a Sierra Leonean poet and journalist. Gbanabom Hallowell studied Writing at Vermont College of Union & Institute University, USA and he is currently the Director-General of The Sierra Leone Broadcasting Service. A prolific author and human rights activist, Gbanabom is the author of Drumbeats of War (poem) and My Immigrant Blood (poem). The background of the poem can be traced to the 11-year civil war of Sierra Leone (1991 - 2002). The war was very fierce that the poet scornfully refers to it as the gathering at the "dinning table" where compatriots literally feed on each other, rather than on food. The poem is a celebration of violence which saw brother bent on decimating brother until the ECOWAS monitoring group called ECOMOG, led by Nigeria, put out the flames of self-destruction. It should be noted that it is not only Sierra Leone that has experienced war in Africa: Nigeria, Angola, Algeria, Burundi, Congo DR, Ethiopia, Eritrea, Liberia, Somalia, Cote d'Ivoire, Sudan, etc,have had theirs in turn. Thus, 'blood' has become an important image whenever Africa is mentioned in the comity of Nations. In the poem, 'blood' is in itself a trope (metaphor) as the poet speaks of "vegetable/blood" and "gun wounds" or what he calls "the split milk of the moon. The title of the poem suggests that the battle takes place in the East and Northeast area of Sierra Leone where there is a table-land (plateau) of between 1000ft - 2000ft high. The title of the poem suggests that there is a gathering of diners about to feast on a meal. However, this is a terrifying (deadly) meal, and not the usual meal we know about. The poet mocks brothers who have gathered at a dining table to feast on each other after a bloody battle. As suggested above in 'Background', it may have been a gathering of wounded countrymen on the Sierra Leonian plateau in the eastern part of the country during the decade-long Civil war. Even if the country is located in the tropical rain-forest zone of Africa, the poet refers to "desert/tongues" brought about years of gunfire exchange, aimed at exterminating one another. In other words, there has been the withering of the land leading to "vegetables (dying) on their tongues". More reason we are assured that we are still in the rain-forest belt is the availability of "guerillas" which "walk the land while crocodiles surf". War has made the land a deserted one in which "the playground is emptied of children's toys," while the available water has become polluted when "cholera breaks its spell on cracked lips". Note that "cracked lips" signify thirst. The Dining table is a serious poem that records what the poet witnessed during the Sierra Leonean war. The poem opens with a powerful imagery that sparks off the reader's senses. The poet describes to the reader, the horrific nature of the war which was characterized mainly by shootings, maiming and death. The main cause of conflict was the struggle for the control of Sierra-Leonean diamonds, which is the most significant wealth in Sierra Leone which the poet symbolically portrayed as "dinner". In the second verse, the poet recalls how the guerrillas operated freely and how they brutally killed and terrorized the people. He remembers how the government forces and their allies which he describes as "crocodiles" also killed and committed atrocities during the war. He also recalls how Sierra Leone thereafter threatened by an outbreak of cholera epidermic which led to the death of many of its population. In the third verse, the poet resolves to be a change-agent (revolutionary). He admits that though he desires a political revolution, he lacks power and needed the support for a revolution, having just survived a brutal war. Tonight's dinner is not the usual feast to be looked up to. It is a dinner of "gun wounds", "vegetable blood", "pepper" and "scorpions". It is a landscape devastated by the carnage and despoliation brought about by war. The sombre portrait of a devastated land is reinforced by the fact that it is night, the time of evil, darkness and horror. The "guests" made reference to may have been partakers of the dinner or Sierra Leonean who came to observe this macabre dinner. As they "look into the ocean of bowls", the horror causes "vegetables die on their tongues". Hence, there are two types of "tongues" - "desert tongues" which could refer to tongues of gunfire and human tongues with which to taste the ghostly dinner. "The table" refers to either the land flattened by the power of gunfire or the table land (plateau) of the north eastern part of Sierra Leone. While the combatants and the wounded soldiers are on this table ruing their fate, the guerrillas and the crocodiles (the uncaring leaders) engage in their favourite pastimes. The child soldiers whom the poet describes as "children from Alphabeta"participate in the sombre meal. ... They know not what the cadaverous get together is all about as they arrive "with empty palm". In their eyes is anger, while "their voices" are assailed by silence. The poet-speaker asks : "when the playground is emptied of children's toys who needs roadblocks?" This is both a rhetorical question and an aphorism. The fact is that the children had taken their toys inside, before they and all adult men went to do the fighting. Thus "road blocks" have suddenly become unnecessary. The land has become both sterile and arid occasioned by the destructiveness of war. The dryness steers the necessity for the throat to be assumed of its thirst. But the water has been polluted by "vegetable blood" and "gun wounds". Hence, the threat of "cholera on cracked lips" is real. Lines 19 - 23 The poet, having tasted "the split/milk of the moon" which might as well be the blood of yellow youths, he promises "to be a revolutionary". However, his "Nile, even without tributaries comes lazy upon its own Nile". The revolutionary to - be has his own problems, namely laziness and indecisiveness. His "Nile ... upon its own Nile" is a pile of drawbacks, layers of in-capacities. The poet returns to what happens at "dinner tonight" (which) comes with gun wounds". It is a night meant for "lovers of fire". The poet persona is "full with the catch of gun wounds" which reminds one of hunting. The drawbacks, obstacles weigh heavily and probably soaking water on his boots such that they "have suddenly become too reluctant to walk me". Such is his weariness that the speaker expects the boots to "walk" him rather than the contrary.